Verona, thanks to the abundance of Roman remains scattered all over its territory or exposed in its museums allows, like no other Italian city except Rome, to "travel" along the different steps of Roman history. With the support of Roman monuments and remains, the themes of the Roman history can by studied in specially designed didactic guided tours. The origins, the Empire, the decline and the first barbaric invasions, anlysing also the logistic aspects, the every day life, the religion, the politics, the economy of a typical roman city: Verona. Verona, with the Archaeological Museum, the Epigraphic Museum, and the Scavi Scaligeri (the exceptional underground museum of Verona) becomes a precious tool to understand and deepen the knowledge the complex history of the Roman age. Verona was built in the first stage of the Roman expansion as a strategic base for the following control of nothern territories through the river Adige valley. Alla the streets lead to Rome, but many street lead to Verona too... Verona was in the center of an important Roman roads network, where the Postumia road, the Gallica road and the Claudia Augusta road met. Still today the routes established by these roads of the past and even remains of the Roman roads themselves, with their particular construction system, can be seen in town. Remains of the Postumia road, built with the typical basaltic slabs used in Roman roads. The grooves in which the wheels of roman wagons slid are still visible. 700 meters of perfectly preserved Postumia road have been found a meter and a half under the modern asfalt of via Cavour, a road that has been used for 2200 years. It was built on the via Postumia by the wealthy Gavi family in the first century A.D. and it marked the border of the town. Demolished by the French in the XVIII century, was re-assambled on a side of a street in 1930. 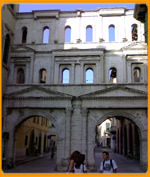 In the development of the Republican Age, Verona became a flourishing city, built according to typical Roman city planning outlines: the system of streets creating a regular grid (the reticulum), with the main square (forum) in its center, still clearly visible today in the disposition of roads in the historical center, and the gates, walls and buildings whose remains can be seen above and under ground all over town. WIth the help of a tourist guide you will be able to see all of these remains in a coherent didactic itinerary. 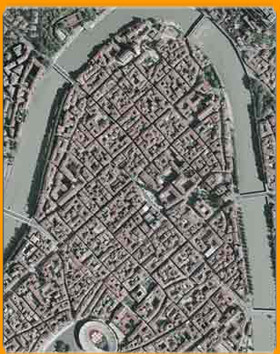 An aerial picture of Verona: it's clearly visible the foundation system of the roman city built in the II century A.D. inside a bend of the Adige river that with its waters integrated the defensive system of the city, like the moat for a castle. The original reticulum (grid) is still visible like the tracing of the defensive walls, the Via Postumia, the forum and, of course, the amphitheater (Arena) and the theatre. Verona as a Roman Colony in the imperial age, with its gorgeous buildings: the theatre, the decorated facades of the gates, the Gavi arch, the amphitheater, the public baths, the houses with their mosaics covered floors. Leoni gate 1st cent B.C. Borsari gate 1st cent. 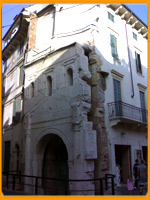 a.D.
Borsari gate, originally called Iovia gate, the main entrance of the Roman Verona on the Postumia road. The daily life in the Roman age can be experienced once again in Verona with the collections of furnishings, small votive statues, objects of daily use, of the Archaeological Museum, in the incredible number of inscriptions displayed in the Lapidario Museum, through which the Romans recorded even the smallest events of daily life. The leisure time of the Romans can be imagined in the two thousands years old theatre and amphitheater. 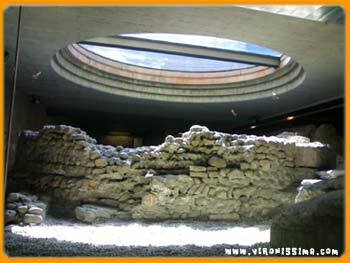 The museum of the Scavi Scaligeri extends, two meters under the entire surface of one of the public squares in the center of Verona, once occupied by a block of the reticulum of the Roman city. The roads with their sewerager system still visible, highly decorated mosaics pavements of Roman houses illuminated with evocative round windows opened directly on the public square. The last phase of the Roman Empire, emerges in all its dramatic power in the alleys and the hidden public squares of Verona, where the remains of the Gallieno Walls are still visible. Constructed in only six months under the terror of one of the first barbaric invasions in the 265 A.D. they incorporate inscriptions, decorations and anything that the terrified Veronese population had closed at hand. To the final stage of the Roman Empire belong also the remains of the first early Christian basilicas and the first places of cult, visible in the complex of the Cathedral and hypogeum of Santa Maria in Stelle outside Verona.